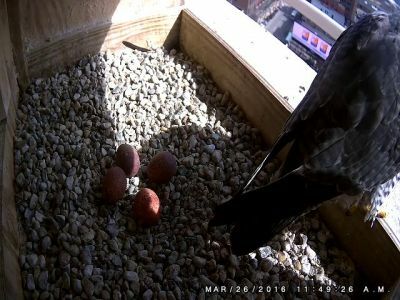 Peregrine falcon, Rebecca, laid the fourth egg of the year on Saturday morning about 10:22. It was a sunny, but cold morning in the mid 30’s and she was serious about covering the eggs immediately and getting them toasty and arranged just right. She did not stand up for a stretch for about an hour and half. This last egg of 2016 came earlier than the earliest egg last year. Rebecca started laying eggs this year on 3/19, followed by 3/21 and 3/24. Four is the average clutch size for Peregrine falcons and is the size of clutches the last two years here in Kalamazoo. Will there be a fifth egg this year?? Both Rebecca and Kewpee have been incubating the eggs. The eggs should hatch in late April after approximate 30 day incubation. Check the video archive to see footage of egg laying and of Rebecca and Kewpee switching places in the nest box.